Please check after the ordering process whether you have received a confirmation of order by email. It can take up to one hour until our system sends this email. Please check also your spam filter. Due to different letter sending times, receipt of your letter can be delayed by up to seven working days and for mailing to countries outside Germany possibly even longer. We will inform you by email as soon as we will have posted your order. Unfortunately it is not possible for us to change or cancel your order. Automatic processes ensure that after you send your order, the tickets are reserved at the promoter. In this way we can immediately reserve the seats selected by you and send you the requested tickets even quicker. Replacement, rebooking or cancellation of tickets are not accepted by the promotors on whose behalf we act. You are clearly informed about the binding nature of your order during the order process. Ticket orders are not governed by the German Distance Selling Act. § 312 b para 3 No. 6 BGB (German Civil Code) stipulates that the law does not apply to contracts concerning the provision of services in the field of leisure activities, including concerts. This means that a two-week right of cancellation and return is excluded. Please consider also our Standard Terms and Conditions in this respect. What is the meaning of “Tickets currently not available” or “Undeliverable”? The prompt “Tickets currently not available” means that the ticket quotas available to us are currently exhausted. We endeavor to get new quotas from the promoter. Please have another look at myticket.de later. The prompt “Undeliverable” means that the date of the event is imminent and that the tickets can no longer be delivered due to the short lead period. The personal data entered by you upon registration are collected, processed and used by myticket AG only for the purpose of establishing the corresponding contract, executing and handling the contract as well as for billing purposes. myticket AG will not pass on your personal data to any third parties and, more particularly, not to any other companies or other organizations, unless you expressly authorize myticket AG to do so or myticket AG is obliged by law to pass on such data, for instance pursuant to a court order or instructions by public authorities. More detailed information is included in our data privacy provisions. You can use your myticket-voucher, when you order tickets for events offered on myticket.de. Just choose your tickets and click at the cart on the link “Do you have a voucher?”. You will then have the possibility to enter your voucher code. After you click on the button “Use voucher” you will get a discount on the regular ticket price in the value of the voucher. You cannot use a voucher to by another voucher and you cannot use a voucher after you already booked your tickets. It is only possible to use one voucher per order. If there is a remaining amount, you can use it for another order (no pay-out). Can I return my tickets (in the event of disease or the similar)? Unfortunately it is not possible for you to return your tickets. Automatic processes ensure that after the sending of your order the tickets are immediately reserved by the promoter in our web shop. In this way we can immediately reserve the seats selected by you and send you the requested tickets even quicker. Replacement, rebooking or cancellation of tickets are not accepted by the promotors on whose behalf we act. You are clearly informed about the binding character of your order during the order process. Can I directly select my seats in the seating chart? A booking in the seating chart is possible for many events via the button “Book directly in the seating chart”. Selected seats are shown in green, already sold seats are displayed in grey. In the same way you can have a look at the price categories offered in the seating chart. If you book several tickets, seats that are next to each other are automatically offered, if available. If you want to have separate seats, you must carry out individual orders. How many price categories exist? The number of price categories varies depending on the event and venue. Please check in the seating chart the price category you want to select. Is there a group discount and how can I order more tickets than the maximum amount? Unfortunately we do not offer a group discount. However, there are different promotions which can include group discounts. You will see them directly in the ticket offering. You can buy a maximum of eight tickets per order. If you want to buy more than eight tickets, you must place several orders. Can I also order my tickets by phone or by email? An ordering of tickets by email is unfortunately not possible on myticket.de. Tickets can exclusively be booked through the online booking system or via our booking hotline (only reachable in Germany/ German-speaking booking agents). In exceptional cases, for instance for wheelchair seats, we often specify separate ordering routes. Do children, pupils, students, senior citizens or disabled persons get discounts? If discounts are available, they are specified on our Homepage next to the events. They can be selected in the shopping cart for the individual ticket positions. Please note that after an order has been placed, no discounts can be granted subsequently. Please note also that possibly evidence may be requested (e.g. pupil or disabled ID). In individual cases it is possible that payment can only be made by credit card for an event (if the event takes, for instance, place in the very near future). Payment possibilities in respect of which you must state your data are carried out with certified providers, so that these routes are completely secure. For all payment possibilities the order is only processed after receipt of the payment. We ask, therefore, for your understanding that for the payment possibility “transfer” it can take between 5 and 12 days before your tickets are sent to you. What is Amazon Pay and how does it work? How does payment by transfer work? Please indicate nothing but the order number in your transfer reference. Otherwise, we will not be able to assign your transfer to your order. Please transfer the total amount of your order at once. Instalment payment cannot be assigned to your order and will lead to the automatic cancelation of your order. If you placed several orders, please transfer the total amount of each order separately and indicate the corresponding reference. Please note that your international transfer can take up to 4 working days to arrive on the transfer receiver’s bank account. Please note that your tickets will only be printed and shipped once we have received your payment. To make sure that you receive your tickets on time, please transfer the amount of your order as soon as possible. Should you not transfer within the stipulated period, your order will be canceled automatically. Is payment by installment possible? I have not received the ordered tickets or a wrong number of tickets. How do I proceed? Please contact immediately our customer service so that we can take care of your problems. Shortly before the event or on the day of the event complaints cannot, unfortunately, be processed any more. How long does the delivery of the tickets take? The shipping takes place after we received the money for your order. We inform you via e-mail about the payment receipt. If you ordered your tickets via print@home you will receive your tickets as an attachment in this e-mail. As soon as we hand your tickets over to our partner Deutsche Post DHL, we inform you via e-mail. Depending on your place of residence, the delivery can take up to 2-3 weeks. Especially if you order from overseas, we recommend, that you do not order tickets too shortly, even if you choose expedited delivery. What are the delivery costs and what methods of delivery are available? The shipping fee includes our service fee (precisely: our costs for the ticket itself, printing, packing, postage etc.). As a matter of principle, all tickets are sent as so-called soft tickets in the DIN long format.The shipping takes place after we received the money for your order. We inform you via e-mail about the payment receipt. If you ordered your tickets via print@home you will receive your tickets as an attachment in this e-mail. Can I offer tickets as a gift and have them wrapped? If you want to offer tickets as gifts, you can simply use the delivery address of the recipient of the gift. Please mind, that the gift wrappers we offer, will be lying next to the ordered tickets. Can I have the ticket blocked? A blocking of the ticket is possible in individual cases. In order to prevent any use of the ticket by third parties, please contact immediately our customer service. My Print@Home tickets cannot be printed. What can I do? If you have problems printing your Print@Home tickets, please specify in the print settings that two pages should be printed on one sheet. Please click on "Print" as usual. A new window will open in which you can click on "Multiple" under "Customize page and options". 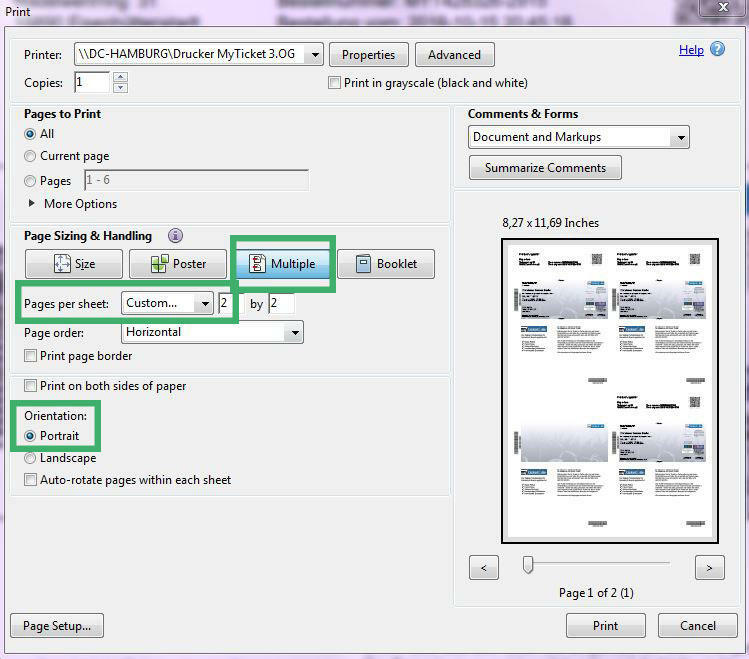 Then select the 2 for "Page per sheet". Enter "Portrait" as "Orientation". Now print the tickets. Now two tickets should be printed next to each other on one sheet. May tickets be partly returned? Replacement, rebooking or cancellation of tickets are not accepted by the promotors on whose behalf we act. You are clearly informed about the binding nature of your order during the order process. May I resell the purchased tickets? The tickets may not be sold commercially or at a profit. The respective promoter can lay down specific regulations in this respect. It is permitted to family/friends/acquaintances provided that the original purchase price is not exceeded. May I use the purchased tickets for contests and raffles? The purchased tickets may not be used commercially for contests and raffles. Do accompanying persons need a ticket? Every person who wants to attend the event needs a valid ticket. Do children need a ticket? May I have my child sit on my lap? This varies from event to event. If there are discounts or special rules for children, we point this out during the order process. Please ask the respective promoter prior to purchasing tickets whether children need a separate ticket. I have lost my ticket, do I get a replacement? It is not possible to send you a replacement if you have lost your ticket. Tickets are valuables and must be treated accordingly. Can my ticket also be used as a ticket for bus and train? If the ticket can be used as a bus and train ticket, it is shown on the ticket where and during which period (to travel to and from the event) the ticket may be used as a train or bus ticket in local public transportation. May I alter my ticket by rendering, for instance, the price unrecognizable? The inscriptions on the ticket may not be rendered unrecognizable. The use of a removable sticker is, however, possible. Since the tickets are printed on thermopaper, do not laminate them, since the tickets are otherwise not readable. The perforated part of the ticket may not be fully detached, because the ticket is otherwise invalid. Usually damaged or lost tickets cannot be replaced. Are the purchased tickets personalized? No, the name of the buyer is not mentioned on the tickets. If there are exceptions, this will be clearly pointed out to you. Can my minor children attend concerts? Unfortunately we cannot inform you about generally valid rules and regulations for concerts. Local authorities or the respective promoters may lay down special rules and regulations for each individual concert within the framework of the German Act for the protection of children and youth. These rules and regulations are, however, not known to us as an advance sales outlet so that we cannot guarantee that minors will be admitted without being accompanied by legal guardians. Please get information from the local promoters prior to the concert, for instance on their Homepage or by phoning the arena, club or stadium. You obtain more detailed information on a specific event, if you call it up on the Homepage or through our search. If you already have tickets, you can also read up the requested information on them. Both the beginning and the name and address of the venue are specified. On our Homepage you will find for every event a link to a route by clicking on the button “Show on map” which is placed under the venue. How do I learn whether events have been postponed or cancelled? In these cases we inform you under your email address. You can also get separate information prior to the date of the concert on our Homepage. For any more detailed information we recommend the website of the event location (arena, club or stadium) or of the corresponding artist, often under the menu item “News”, “Live”, “Tour” or “Dates”. What group will be the support act? All information available to us is displayed on our Homepage in the description of the event. Unfortunately we cannot provide any detailed information on the program, because as a rule we do not have any information in that respect and so-called support acts are frequently confirmed at a late stage. Are sound, photo and/or video recordings permitted during the event? Generally it is rather unusual that recordings of any kind whatsoever are admitted during the event. However, we cannot make any generally valid statements in this respect. Often photos taken with mobile phones and small cameras are tolerated. More detailed information is provided by the local promoters who are stated as a rule on your tickets. For professional camera equipment (e.g. reflex camera) a press ID is often required. The consequences of a violation are decided by those responsible for the event. Are there any autographing sessions during the concerts? Unfortunately we cannot provide you with any generally valid information on this. Please contact the promoter responsible for the concert. Is a cloakroom available for the events? Normally there is a fee-based cloakroom at each venue. In order to be on the safe side, you can go to the website of the arena, club or stadium and obtain more detailed information. My event was postponed. Does my ticket nonetheless remain valid? The ticket remains valid even if the event has been postponed. Are any VIP tickets or Meet & Greets available? VIP tickets and Meet & Greets are special activities which we occasionally offer. These specials are then shown directly with the ticket offers. Do concerts start on time? As a rule concerts start on time. However, there can be many different reasons for delays. We cannot provide you with any information in advance in this respect. May I take beverages to the events? As a rule no beverages may be taken to the events. We recommend that you go to the website of the event/the artist to check whether beverages may be taken along. Can I still book the ticket insurance after I already bought my tickets? Of course you can order your ticket insurance later. Just click here! Do I have to name the ticket owners to the insurance company? No, you do not have to send the names of the ticket owners to the insurance company. In case of sickness or similar, you/the person who bought the ticket insurance can contact the insurance company to hand in the claim. If you do no longer want to get any news from myticket by email, please send an email to abmelden@myticket.de. Please contact our customer service in order to delete your account. If you have any further questions and concerns, then you are welcome to contact our customer service. We will gladly answer your inquiries and send you a response as soon as possible. Thank you for your trust! We are looking forward to receiving your feedback!